Working with an old/traditional software is quite annoying. As usage of traditional manual spreadsheets, non-reliable and other data entry. It seems strange to compete with today’s opponent by supporting old weapons. Therefore, it becomes necessary to convince the owner or management to transform towards cloud based ERP system. Convincing the management towards right technology at right time is an intelligent and tricky approach. Moving towards cloud based ERP solution is undoubtedly an excellent decision. Right decision should be taken without any pressure or limitation. While putting efforts in convincing the management it is important to find out the best suitable software solution for business. Don’t wait until the death of your old traditional system but seek around the technology consistently. During your discussion, keep your focus towards following essentials. Whether you’re a part of customer services, sales, marketing, and accounting department, the inefficiencies of your traditional system could be discouraging. Being a part of the system you might understand but it isn’t necessary that management is going to appreciate your suggestion. They will never try to understand its urgency and concern for the organizational cost and other benefits. 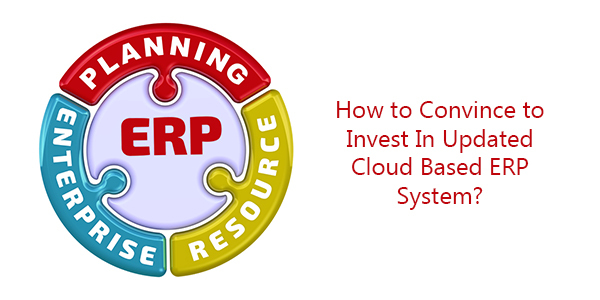 This is an important point to discuss with management that right cloud based ERP software solution is cost efficient. Demonstrate different testimonials during the discussion to convey your message in effective manners. Your information technology department can play an important role in convincing the management. They can explain the cost-saving approach to management. Implementation of an ERP software may improve the data security and reliability. Marketing and other executives may take initiative in this regard. All of the IT infrastructure management benefits should be discussed in detail to convey your message. During the discussion with your higher management, it is necessary to prove your point through testimonial and demos. A demo is strongly required to demonstrate your opinion. Arguments should be according to the situation. Therefore, well search the right ERP software solution for your business by considering all possibilities and expectations. Compare different technologies, solutions, and recommendations to find out most reliable and trustworthy solution. A comprehensive search will enhance your confidence and improve your understanding too. Once your own understanding has reached its level, it will be more convenient to share your thoughts and ideas. The best part of the debate or discussion is, to staying focused towards “why”, “how” & “what”. A comprehensive report along with all benefits should be prepared before starting the discussion. It should be well-planned with deep analysis and implementation details. Business management and the owner may get more clarifications and suggestions through this report. It also contains the estimated risks and costs. Staying focused on major questions may describe the solution in positive manners. Explain how a cloud based ERP software can be beneficial for an organization and its different procedures. Whether you’re a part of the large, medium or small business, cloud based ERP software solution grows with it. It scales up and down without any discrimination of any industry. It is required at the competitive edge to maximize the resource utilization and staying ahead. It supports in the delivery of most productive tasks with complete control. Its flexibility and customization are one of the most preferred industrial requirement. It has significantly enabled the business to stay focused on its core business operations and goals.